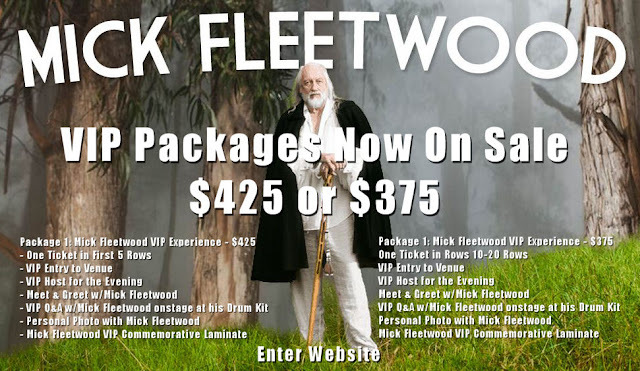 Mick Fleetwood VIP's are now available for Australia and New Zealand. This is a great once in a lifetime opportunity to meet the great Mick Fleetwood! Not only that, you secure an exceptional seat for the show especially if you select the $425 category! When you consider that a normal ticket to the show without all the bells and whistles below can cost you upwards to $200 or more, $425 is a pretty amazing offer when you throw in the Meet and Greet and the seat in the first five rows etc. What's too bad is that this information was held back until well after the pre-sale tickets and general public sale was well under way. Check out Mickfleetwoodofficial.com and click on EVENTS at the top of the screen for the list of available shows.